C. lanuginosa of Michigan Flora. Sandy or marly shores (often in shallow water), marshes, meadows, swales, river banks, rarely in drier habitats as on dunes or sandy, savannas (jack pine or oak-aspen); spreading by strong rhizomes. Long known as by the name C. lanuginosa, the type of which, however, is a specimen of C. lasiocarpa. The culms tend to be more sharply 3-angled and rougher in C. pellita than in C. lasiocarpa. Carex ×subimpressa Clokey, treated as a species in Michigan Flora, is an occasional hybrid of C. pellita and C. hyalinolepis. It is known from Lenawee, Monroe, Wayne, and Washtenaw Cos. 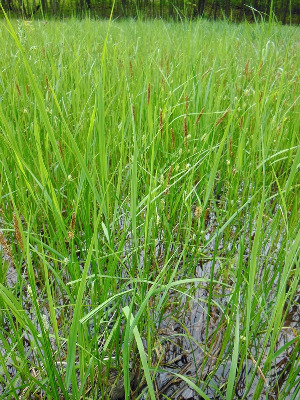 Though sterile, it can form large and conspicuous clones in ditches and other moist, open, often disturbed habitats. See Reznicek and Catling (1986) for more information. Carex pellita also rarely hybridizes with C. lacustris (the basis for mapping C. subimpressa in Montcalm Co. in Michigan Flora; also known from Lenawee Co.). MICHIGAN FLORA ONLINE. A. A. Reznicek, E. G. Voss, & B. S. Walters. February 2011. University of Michigan. Web. 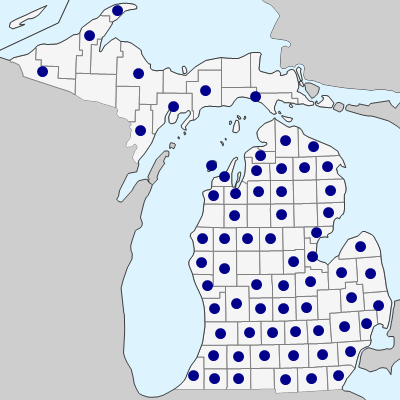 April 21, 2019. https://michiganflora.net/species.aspx?id=1025.